1One rather striking description of what lies behind the various phenomena we now refer to with the term "globalisation" comes to us from the chairman of Magna International, a Canadian-owned auto-parts manufacturer whose production lines are located in Mexico. "To be in business," he states, "your first mandate is to make money, and money has no heart, soul, conscience, homeland" (Henwood, 1997, 113). If this is the world of business and money, might politics be its obverse? To be sure, politics always has a soul – however benevolent or malign – and a conscience – however troubled, clouded, or clear. But does politics always have a homeland? The reinvigorated spread of market economies, the decentralisation of production processes, and the development of communications and information technologies have had significant implications for both economics and culture, as money and other commodities move increasingly unhindered across national boundaries. We might ask, though, whether the material processes of globalisation have had similar effects on ideology. One well-known model of ideology, suggested by Marx in The German Ideology, presents us with something of a paradox. To view ideology as necessarily having material causes or pre-conditions would seem to predict the reinforcement of transnational political identities in an era of economic globalisation. Instead, the past two decades have seen a withering away of the last vestiges of internationalism and the proliferation of political identities smaller and more inward-looking than even those of the twentieth-century nation-state. 2To some observers, the world after 1989 was destined to be animated by the dynamics of what was buoyantly referred to as a "new tribalism". In the 1950s and 1960s, American political scientists tended to use the concept of tribalism exclusively to explain the setbacks and failures of modernisation in the developing world. In these studies of what was understood to be a transition from tradition to modernity, tribalism was that repressed form of political behaviour constantly threatening to rush the stage should modern representative forms momentarily falter. Thus, there was a ring of familiarity in the air in 1992 when Michael Walzer announced that after the collapse of the Soviet Union, "the people" would now return to political life, "marching in tribal ranks and orders, carrying with them their own languages, historic memories, customs, beliefs, and commitments" (Walzer, 1992, 164). This sort of tribalism was supposed to be an emancipatory version, a cry for justice by the myriad cultures and peoples who on Walzer’s account "ought to be allowed to govern themselves". There is a considerable slippage here from a notion of the social construction of national entities to a kind of new essentialism of the ethnic nation. Many of its implications must be taken up elsewhere.1 What we can note for the present moment is the fact that the rise of ethnic nationalist and other particularistic movements was regarded by many on the political left as a progressive development. Today, the assertion of a particularistic identity has become the archetype of left politics, something incomprehensible to the older traditions of left internationalism for whom particularistic movements could be supported only tactically. Yet it remains undeniable that from the 1960s onward, left internationalism failed to renew itself. 3In 1976, Perry Anderson closed his Considerations on Western Marxism by asking how internationalism could be made a genuine practice rather than merely a pious ideal (121). Seven years later, Benedict Anderson posed a similar question to internationalism, though one resonating with the mounting triumph of nationalist political identities: why had Marx suggested in the Communist Manifesto that the proletariat would necessarily have to settle accounts with its own – national – bourgeoisie (Anderson, 1983, 3-4)? The implication of the former is an indictment of practice: how was it that internationalism had fallen into disrepair? The implication of the latter, far more damning, is an indictment of theory: how could internationalist political thought have been so blind to the power of the nation? These questions are worth returning to, I think, when considering the possible tensions and contradictions between globalisation and national political membership. What specified internationalist political thought (and what distinguishes it in particular from theories of international politics or international relations) was its critique of the nation and national political identity in the context of increasingly globalised economic activity. A reconsideration of internationalist political thought, then, may help to shed some light on at least two sets of questions with contemporary relevance. First: why was transcending the nation-state perceived to be important? What are the possibilities and the limits of a political practice rooted in and oriented towards the nation? Second: how are transnational political identities formed? Under what conditions does internationalism become a real, living practice, and under what conditions does it fall away? 4If the years between the late-eighteenth and mid-nineteenth century in Europe were, as Benedict Anderson has described them, "the dusk of religion and the dawn of nationalism" (1983, 11), what this image would seem to neglect is the birth, during the latter half of this period, of nationalism’s self-conscious alternative, internationalism. Of the two, nationalism was clearly the dominant force. Early European nationalism, as Eric Hobsbawm has argued, was not only a self-conscious ideological project, but a pervasive and near mystical belief in the logical necessity of nations defined by culture, ethnicity, and language (Hobsbawm, 1997, 105). That belief, as Hobsbawm rightly emphasises, must be set against the historical fact that no nation-state came into being as the expression of a natural and necessary identity. In 1857, the epitome of self-conscious European nationalism, Giuseppe Mazzini, drew up an ideal map of Europe consisting of eleven nation-states. Sixty-two years later, presiding over a systematic redrawing of the boundaries of European states, Woodrow Wilson proposed a map composed of no fewer than twenty-six sovereign states (Hobsbawm, 1997, 107-8). On the one hand, the self-conscious ideology of nationalism was necessarily an exclusive project, staking a claim to selfdetermination as against other nations. On the other hand, within the early European nationalist movements, particularly the "Young Europe" groupings founded or influenced by Mazzini, the nationalist project implied a certain type of transnational solidarity: all nations struggling to be bom were perceived to be working towards a common objective and were therefore comrades in arms. But, following a trajectory that would be repeated just over a century later in the disintegration of Pan-Africanism, as nationalist movements won their struggles for sovereignty, such latent internationalist sentiments fell by the wayside. In the national struggles of the proletarians of the different countries, [communists] point out and bring to the front the common interests of the entire proletariat, independently of all nationality. 6The authors go on to make what is surely the most famous statement of political internationalism. Refuting the charges that Communists, given charge of the organs of power, would want to do away with countries and nationality, they respond that the working-class has no country and no one can take away from them what they have not got (ibid., 58). The usual interpretation of this passage holds that Marx and Engels would have been baffled by an expression of working-class nationalism; that in their view, the proletariat was simply incapable of thinking nationalistically. Roman Szporluk, for example, writes of Marx: "He did not envisage the proletariat succumbing to nationalistic temptations proffered by the bourgeoisie" (1988, 35). The significance of national political entities for Marx’s vision of social revolution, however, goes much further than the question of whether or not the proletariat was capable of being swayed by a nationalistic appeal. The "world-historical role" of the proletariat, he maintained, "is not a question of what this or that proletarian, or even the whole proletariat itself, imagines to be the goal for the moment" (Marx, 1971, 23). Internationalism was ultimately both a philosophical and a strategic element of Marx’s political thought, but one thing it was not was a matter of mass faith. 7The roots of Marx’s political thought lie in his twin critiques of alienation and political emancipation. Citizenship in the modern liberal state was, on this account, at once a genuine political victory and a cruel joke. Universal citizenship – political emancipation – blazed the way forward and at the same time cut the bottom out from everything that it offered. Citizens in the liberal state were now free and equal as abstract political beings, while remaining "the playthings of alien powers" in every other aspect of daily life (Thomas, 1994, 84). The implications of this position become clearer in Marx’s initial consideration of the Irish question during the 1840s. Though maintaining unequivocally that English rule over Ireland was, "the most abominable reign of terror and the most reprehensible corruption," he saw no solution to the situation in the creation of an independent Irish state. Its small size and economic underdevelopment would leave it mired in poverty and subject to the dictates of capital if not to those of the crown (Bloom, 1967, 38). The firming-up of a national boundary between England and Ireland, then, could release the grasp of one alien power, while another – equally alien and equally oppressive – would remain comfortably in place. 10The claim here is not that the modern working-class will be incapable of thinking in the register of nationalism, but that should it fail to transcend the limits of the nationstate in its political practice, whatever victories it might win could go no further than the forms of emancipation compatible with the existence of capital as a global power, free from political control. 12"England," he concluded, "seems to be the rock on which revolutionary waves are shattered, where the new society perishes in its mother’s lap" (ibid., 44). National social revolutions could lay hands only on national institutions and instruments of power. Capital, however, refused to be bound by the fictions of nationality. It was – and was becoming increasingly – transnational. 15In the language of contemporary political slogans, it would not be enough to "think globally and act locally". Internationalism, for Marx, was not a matter of kind sentiments, but the cmcial element making possible social revolution’s success or assuring its defeat. 17What the International resolved to do was to make every effort to prevent the outbreak of war and in its event to work towards its immediate end, making appropriate use along the way of the political crisis it was sure to precipitate. As is well known, when the moment of decision came, most of the International’s affiliated parties followed exactly the opposite course. 19Internationalism, then, had specific meaning only in peacetime. Once national armies were arranged in the field against one another, socialist internationalism was to be subsumed under the expedients of national defence. Like the Lassallean authors of the Gotha Program, Kautsky conceived of internationalism as the fraternal relations between national parties occupied with what were ultimately national struggles. Upon winning power, they might all get along amicably, but the working-class political project was first and foremost a national project. 21Above all, the experiences of the slide into war convinced left social democrats such as Luxemburg, Lenin, and Trotsky of the need for international political action rather than simply fraternal solidarity between national parties. As the post-war revolutions rose in eastern and central Europe, two further points – both noted by Marx in the wake of 1848 – became clear. First, national revolutions had international effects. The Bolshevik revolution in Russia provided the inspiration and the models of organisation for the rising in Germany less than a year later. Second, an isolated national revolution stood little chance of survival. About the latter point, the Bolshevik leaders were clear. Arguments both for and against the seizure of power were moved by considerations of the readiness of the German working-class to make a revolution and the ability of a Bolshevik government in Russia to come to their aid. In any case, Russia lacked the social and economic development necessary to build a socialist society in a capitalist world. "At all events," Lenin maintained, "under all conceivable circumstances, if the German revolution does not come, we are doomed" (Liebman, 1975, 361). On the one hand, as Lenin and later Gramsci pointed out, Russia’s lack of development facilitated revolution. On the other hand, once the more developed countries had succeeded in revolution, Russia would follow rather than lead. "Perhaps we are making mistakes," Lenin conceded in an address to the Eighth Party Congress, "but we hope that the proletariat of the West will correct them. And we appeal to the European proletariat to help us in our work" (ibid., 408). 22Since the beginning of the war, both the Bolsheviks and the German left opposition leaders had argued for the creation of a new International, stressing two ways in which it would have to differ from the collapsed body. First, it would need binding power over its member parties. An International which could take resolutions against militarism only to have its affiliates march off to opposite sides of the trenches was useless. Second, it would have to develop a genuine capacity for international action. In this vision, internationalism was to be a way of practising revolutionary politics rather than an ultimate goal of world peace. The Third or Communist International was founded in Moscow in 1919, but like the Bolshevik revolution, it waited for Germany. The only German delegate at what was meant to be the Comintern’s founding conference had been instructed by his party to oppose the premature formation of a new International. While supporting the initiative in principle, the Germans wanted to be sure that a new International would have sufficient forces with which to support the working-class struggle. Only the late arrival of a delegate from Austria and his presentation of a highly optimistic picture of the chances for revolution in central Europe convinced the conference to proceed with the Comintern’s founding (Degras, 1971, vol. 1, 16). 23The Comintern’s binding power came in the form of its "21 Conditions" for affiliation, demanding of member parties a high degree of ideological unity and coordination of action. In the "Thesis on the National and Colonial Question" adopted by the Second Comintern Congress in 1920, proletarian internationalism was defined as demanding the subordination of national interests to the struggle on a world scale and the making of sacrifices for that world struggle by the nation first to achieve victory (ibid., 143). The Comintern was intended to be an infrastructure for internationalist action and at its height encompassed sixty-five affiliated parties with some three million members. Stalin’s turn toward the vision of "socialism in one country" in 1924, however, increasingly drove a wedge between those who identified with the goals of the Comintern and those whose loyalties were exclusive to the "Centre" (see, for example, Perrault, 1969). Thus the tension in the Comintern’s executive committee when considering the outbreak of the Spanish Civil War in 1936. Risking accusations of Trotskyism in the wake of the executions of Zinoviev and Kamenev, the ECCI recommended taking action to support the left Popular Front government under siege by Franco’s troops (Carr, 1984, 15;. 20). 24In September 1936, the Comintern’s affiliate parties in Europe were instructed to begin recmiting volunteers to fight in Spain (Johnston, 1967, 36). The American Communist Party was brought into the effort three months later (Carroll, 1994, 9-10). By the end of the war, the total number of those who had joined the International Brigades reached 35,000. Most of the volunteers were European nationals, but at least 4,000 came from the United States and Canada, and a few even reached Spain from as far away as Mexico and South America. If the collapse of the Second International into opposed warring sides marked the low point of socialist internationalism, the organisation of a military force consisting of volunteers from around the world united by political principle was surely its height. At least one observer has argued that the Comintern’s involvement in the organisation of the Brigades was unnecessary – many volunteers made the journey to Spain without the help of communist parties and many more would have done so had such help not been available (Johnston, 1967, 151). Yet the numbers of socialist and anarchist volunteers who joined the International Brigades were far fewer than those connected to communist parties and youth organisations (Carroll, 1994, 71-2). Travel to Spain from the United States and from France was illegal during the war and under any circumstances, from overseas, it was costly. It was only the organisational infrastructure of the communist parties, their collective resources, and their experience in underground work which made such an operation possible. Tickets for volunteers coming from overseas were paid for by the party, though in most cases reimbursed by the Spanish government. Once in France, an elaborate network of party members and sympathisers housed and fed the volunteers and transported them across the border (Carroll, 1994, 66-7; Bessie & Prago 1987 66; 69-70). 25 At a purely organisational level, the existence of that infrastructure made the International Brigades possible. Yet we should also note the more subtle (though probably more significant) ways in which the nature of the Comintern created the possibility of such an unlikely political event. The American volunteers of the Abraham Lincoln Battalion (to take just one example) came from a wide variety of class and educational backgrounds. Most came from large urban areas, but by the end of the war virtually all sections of the country were represented (Carroll, 1994, 15-16). What they had in common was a sense of participation in a transnational political struggle. "When the crisis broke," one volunteer recalled, "we were ready" (ibid., 71). That sense of internationalism did not come from the course of events itself but from the ways in which mass-based Comintern affiliates were able to give transnational political vision a material content. Particularly for those in cities with large Communist Party and Young Communist League communities, such as New York, an internationalist political identity became a meaningful part of everyday life. In other words, as ideology, internationalism became a lived practice. Q: So what feelings, when you think of Spain, what feelings do you retain? What comes up for you? Q: Tell us about the war. A: There’s the bombing... There’s the hunger... There’s the cold weather... the hot weather... There’s the wounded, who suffer miserably. There’s the dead, who are probably the luckiest of all. War’s horrible. War is obscene. Q: So are you proud you went? 27What possible comparisons could we draw between the internationalism of the middle 1930s and more contemporary events? One possible candidate might be the international support for organised resistance to apartheid in South Africa. After the early 1960s, as an exile organisation, the African National Congress (ANC) was entirely dependent on support from foreign governments and solidarity organisations for its survival. Nelson Mandela’s tour of the newly independent African states in 1962 won promises of assistance, yet the leaders of those states had little ability to deliver. Economically, the decolonised countries were weak, and militarily, those sharing a border with South Africa had no capacity to resist the South African army. The bulk of support for the exiled ANC came from the Soviet Union, East Germany, and the Scandinavian social democracies. On the one hand, Soviet aid for the antiapartheid struggle was driven by a Krushchev-era optimism (Shubin, 1999, 41). On the other hand, it was – unlike Comintern-era efforts – distinctly ad hoc and increasingly conceived of as foreign aid rather than as socialist internationalism. Likewise, while the ANC’s indisputable moral high-ground won it the backing of a broad international anti-apartheid movement, the relations of solidarity never transformed into a deeper sense of commonality. 29By 1975, a somewhat different mood was apparent. In that year, as Angola became independent with a self-professed Marxist-Leninist government coming into power and Cuban troops arriving to help it repel an invasion by the South African army, an ANC strategy and tactics document associated the organisation with "the world’s progressive forces" and looked toward the building of, "a non-racial, ultimately nonnational world society; a society without class" (ANC, 1975, 1). This sort of internationalism fell away after 1990. While the ANC in government has maintained its ties of friendship with the countries from whom it received aid while in exile, there is little perceptible sense today of a connection between its agenda and political concerns on a global scale. More disturbingly, at a popular level, what has tended to characterise South African society since its first non-racial elections in 1994 is a sometimes violent xenophobia directed against immigrants from other African states. 30It goes without saying that the ideological practices of internationalism have disappeared from our world, and it is in this sense that I opened this discussion with the German Ideology paradox: how can it be that ideology is conditioned by circumstances when in an era of economic globalisation internationalist political thought has vanished? An answer, I believe, lies in the contrast that can be drawn between the collapse of the Second International and the organisation of the International Brigades. What the experience of the Brigades shows is that ideology is not a matter of coincidentally shared ideals; it is not free-floating. Rather, ideologies – to become genuinely meaningful – must become living practices and this can only occur within institutions. The internationalism of the Second International collapsed in the face of war because its structures and institutions were ultimately national. Its internationalism was one of fraternal relations between national movements. By contrast, the Comintern set out to develop internationalism as a transnational form of political practice. It succeeded, to some degree, despite Stalin’s efforts to incapacitate it. The elimination of the Comintern in 1943, thus, mattered in that internationalism as an ideological practice had less to rebuild from after Stalin’s death. 31In order to understand internationalism as ideology, then, we must make a partial return to Althusser. In this sense, as an ideological practice, internationalism is no different from nationalism: it is an invented tradition requiring institutions in which to become lived and real (see Hobsbawm and Ranger, 1983). To Benedict Anderson, then, we must reply that the necessary preconditions of "imagined communities" are institutions. Why, then, for Marx, would the proletariat first have to settle accounts with its own bourgeoisie? Because of the material power of national political institutions. Internationalism did not propose that social revolutions could ignore the institutions of the nation-state, but that they would have to transcend them. In order to do this, both materially and ideologically, internationalist institutions would have to be built. Here, then, we can also find an answer to Perry Anderson s question. Internationalism became, and can only become, a reality rather than a pious ideal to the extent that it becomes a lived practice within institutions capable not only of solidarity and fraternal relations but of deep commonality and action. 32We can conclude from this that economic globalisation will not automatically result in the formation of new, transnational political identities. It will, however, make national and sub-national emancipatory projects less meaningful-though no less attractive. As economic forces slip out from under the nation-state, national democracies will find themselves with diminishing control over the material conditions of everyday life. Ordinary people, the ones most likely to lose out in the waves of global turbulence, will seek solace for their losses. They will seek control over the seemingly uncontrollable in national and cultural identity. But they will not find it there. The national and the cultural are concerned with matters of soul and conscience and homeland, and money has declared its freedom from these. Politics might pursue it across international borders, but for the moment at least, such a political practice is nowhere to be found. Anderson, Perry, 1976. Considerations on Western Marxism. London: NLB. Anderson, Benedict, 1983. Imagined Communities. London: Verso. Bessie, Alvah and Albert Prago, eds., 1987. Our Fight. New York: Monthly Review Press. Bloom, Solomon F., 1967. The World of Nations. New York: AMS Press. Carr, Ε. H., 1984. The Comintern and the Spanish Civil War. London: Macmillan. Carroll, Peter N „ 1994. The Odyssey of the Abraham Lincoln Brigade. Stanford: Stanford University Press. Degras, Jane, ed., 1971. The Communist International 1919-1943. Documents. 3 vols. London: Frank Cass & Co.
Henwood, Doug, 1997. Wall Street. London: Verso. Hobsbawm, Eric, 1997. Age of Capital. London: Abacus. —, and Terence Ranger, 1983. The Invention of Tradition. Cambridge: Cambridge University Press. Johnston, Verle B., 1967. Legions of Babel. University Park: Pennsylvania State University Press. Liebman, Marcel, 1975. Leninism under Lenin. London: Merlin Press. Lodge, Tom, 1983. Black Politics in South Africa since 1945. Johannesburg: Ravan Press. Marx, Karl, 1971. On Revolution. In Saul K. Padover, ed., New York: McGraw-Hill. —, 1975. Early Writings. New York: Vintage. —, 1996. Later Political Writings. In Terrell Carver, ed., Cambridge: Cambridge University Press. Marx, Karl & Friedrich Engels , 1998. The Communist Manifesto. London: Verso. [1845-46], 1995. The German Ideology. New York: International Publishers. Perrault, Gilles, 1969. The Red Orchestra. New York: Simon & Schuster. Riddell, John, ed., 1986. Lenin’s Struggle for a Revolutionary International. New York: Monad Press. Shubin, Vladimir, 1999. ANC: A View from Moscow. Bellville: Mayibuye Books. Szporluk, Roman, 1988. Communism and Nationalism. New York: Oxford University Press. Thomas, Paul, 1994. Alien Politics. New York: Routledge. Walzer, Michael, 1992. "The New Tribalism." Dissent (Spring). 1 See J. C. Myers, "What is the New Tribalism?". In Joel Shalit, ed. Disenchantment/Re-enchantment (forthcoming). 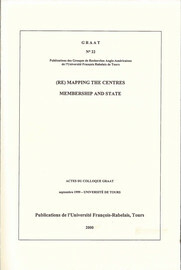 MYERS, J. C. Internationalist Political Thought In : (Re)Mapping the centres Membership and State [en ligne]. Tours : Presses universitaires François-Rabelais, 2000 (généré le 21 avril 2019). Disponible sur Internet : <http://books.openedition.org/pufr/4348>. ISBN : 9782869064737. DOI : 10.4000/books.pufr.4348. Myers, J. C. “Internationalist Political Thought”. Harris, Trevor. (Re)Mapping the centres Membership and State. Tours : Presses universitaires François-Rabelais, 2000. (pp. 159-171) Web. <http://books.openedition.org/pufr/4348>. HARRIS, Trevor (dir.). (Re)Mapping the centres Membership and State. Nouvelle édition [en ligne]. Tours : Presses universitaires François-Rabelais, 2000 (généré le 21 avril 2019). Disponible sur Internet : <http://books.openedition.org/pufr/4314>. ISBN : 9782869064737. DOI : 10.4000/books.pufr.4314. Harris, Trevor, ed. (Re)Mapping the centres Membership and State. Tours : Presses universitaires François-Rabelais, 2000. Web. <http://books.openedition.org/pufr/4314>.